WMATA announced today that the NextBus service, which provides real-time prediction of bus arrival and departure times, will begin operations on July 1st. Previously, Metro tested the service on only a few, select lines...and the 10A, 10B and 10E were not among them. 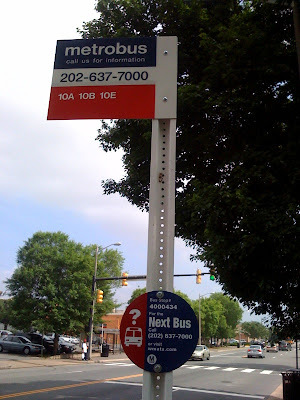 But soon we should see NextBus medalions appearing at all of the stops along the Avenue, just like this one at Executive Avenue. These signs give the phone number to call and the bus stop identifier -- the seven digit number that allows quick access to bus info. While the system isn't yet quite fully activated, riders can currently use the number to access the Trip Planner, a fully functioning, voice-recognition trip planning system similar to the system available at WMATA's online site, that provides schedule information for the DASH bus as well as Metrorail and Metrobus.